Las Vegas has several free live performances throughout the day at several of the resorts. 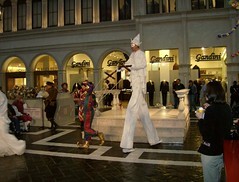 My favorite is the opera at the Venetian, held several times throughout the day with live music and performers. You'll also find great bands at night playing at many of the bars for only the cost of a drink, though these shows do not compare to the amazing headliner performances througout Las Vegas at all the major resorts. Cher, for example, will soon be at Caesar's Palace. Barry Manilow is at the Hilton, Cirque du Soliel has several performances at different venues, and there are dozens more.